Google is trying to save presentation audiences from having to sit through long rambling questions with a new feature it added to its Slides software on Wednesday. 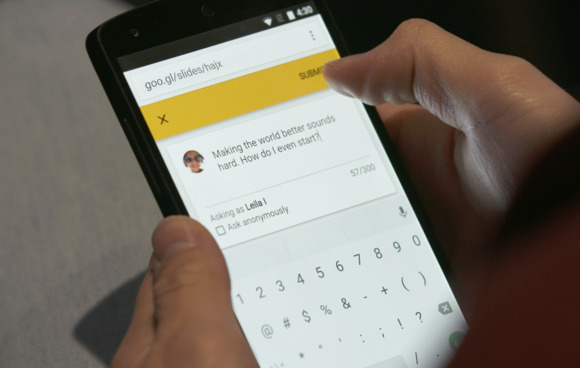 Slides Q&A will let audiences send text questions through the Web when listening to a presentation using Google's software. As a presenter is talking, she can see the questions and respond to them, without waiting for someone to speak into a microphone. 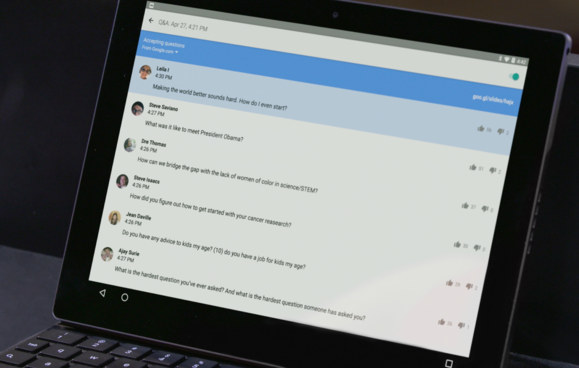 Google Slides Q&A's presenter view lets presenters see what people in their audience want to know. In addition to submitting questions, audience members can also vote on which ones they want to see answered. That means presenters facing a mountain of queries can filter by the most liked and tackle an audience's burning questions. Presenters won't have to worry about making sure that a microphone is set up for audience Q&A, and can instead focus on walking in, giving their presentation, and taking feedback from the audience. It's also a boon for audience members who are more comfortable typing than getting up and asking a question. Asking a question in front of a big group of people can be a daunting task, and being able to craft just the right question in text form may help expand the questioner pool to more people. The Q&A feature will also be especially useful for people who are having their presentations streamed over the Internet. By using Slides Q&A, they can take questions from around the world, without requiring that askers be in the same room. The new feature integrates well with Google Hangouts, too. Google announced Wednesday that iPhone and iPad users can now present straight to one of the company's live streaming video sessions using their mobile device, making it easy to distribute a presentation to a wide variety of people. Google's move here could be a strike against other live commenting services, especially those tied to streaming platforms like Facebook Live and Periscope. It will be interesting to see is if this new feature will be enough to draw people away from Slides' competitors, like Microsoft PowerPoint.